Modular kennel panels are designed for use when ever kennel expansion is needed. 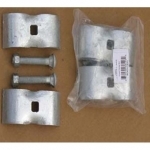 Used with Bronze kennel. Modular kennel panels are designed for use when ever kennel expansion is needed. 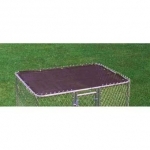 Use with Gold kennel series. 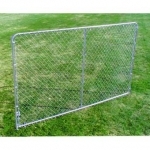 Modular kennel panels are designed for use when ever expansion is needed. Used with 4ft high Silver series. 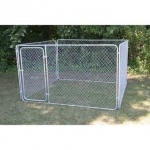 Modular kennel panels are designed for use when ever kennel expansion is needed. 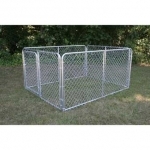 Use with Silver kennel series. 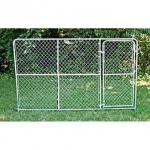 Low price point kennel, designed for customer a with a smaller budget. 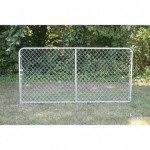 1-3/8in high strength galvanized steel tubing framework, 2-3/8in mesh 12.5 ga chain link, dog proof latch. All four corner bent frame no center brace. Upper end price point, designed for the customer who wants the best for their pet. 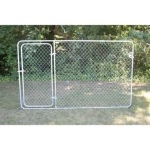 1-3/8in high strength galvanized steel tubing, 2-3/8in mesh 12.5 gauge chain link, dog proof latch. Top corners are rounded, bottom corners are welded with a 1 inch leg for easy cleanup. Each panel has one vertical brace and one horizontal brace. 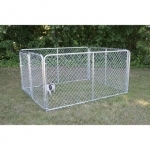 Our most popular kennel, mid price point. 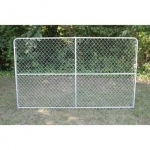 1-3/8in high strength galvanized tubing, 2-3/8in mesh 12.5 gauge chain link, dog proof latch. Top corners are rounded, bottom corners are welded with a 1 inch leg for easy clean up. Each panel has one vertical brace. 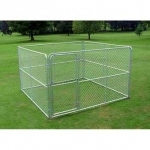 A smaller version of our most popular kennel, great for smaller pets, 1-3/8in high strength galvanized tubing, 2-3/8in mesh 12.5 gauge chain link, dog proof latch. Top corners are rounded, bottom corners are welded with a 1 inch leg for easy clean up. Each panel has one vertical brace. 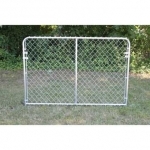 1-3/8in high strength galvanized tubing, 2-3/8in mesh 12.5 gauge chain link, dog proof latch. Top corners are rounded, bottom corners are welded with a 1in leg for easy cleanup. Each panel has one vertical brace. 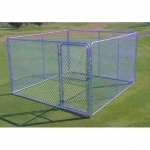 Modular kennel panels are designed for use when ever kennel expansion is needed. Use with Bronze kennel series. Provides the best shade for the customers pets. Mesh weave design installs flat across kennel allowing the cover to remain in place during rain or high wind. Liquid precipitation will seep through. It is recommended that the cover be removed during frozen precipitation events. 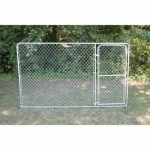 The Stephens Pipe & Steel Silver Series Complete Kennel is the perfect choice if you are looking for a high quality kennel that is easy to assemble. 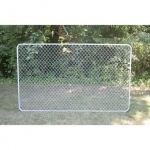 Features include rust-resistant, galvanized steel tubing framework, a dog-proof latch and one-inch legs to allow for easy cleaning. Square bottom corners work to contain smaller pets and its portability helps prevent lawn damage.